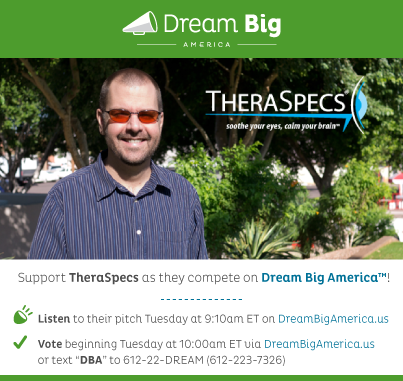 TheraSpecs Featured on Dream Big America, We Need Your Vote TODAY! After being featured on the national radio show Dream Big America this morning, TheraSpecs is in the running for a Kauffman Foundation grant that will help us get TheraSpecs to more people who need them. We need your vote today! To vote, text DBA to (612) 223-7326 or vote online. You can hear Hart’s short radio segment, read some Q&A about the business, and vote for TheraSpecs on the Dream Big America website. Voting is only open until 2 p.m. Eastern tomorrow, so please vote now and spread the word! Thank you.